Solas Bhride Centre has three self-contained Hermitages in Kildare, Ireland which are available for short term stays for those who wish to have time out for quiet reflection and rest and/or time out for silence and prayer. Accommodation is provided in single Hermitages situated on the grounds of the Centre. St. Brigid’s Well is nearby and also the Japanese Gardens and St. Fiacra’s Gardens in the grounds of the Irish National Stud. Those who stay at the Hermitages may wish to walk the labyrinth in the Centre grounds. 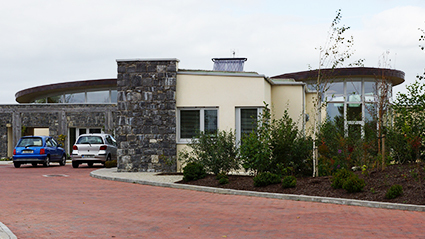 The Solas Bhride Centre is within walking distance of St. Brigid’s Cathedral and St. Brigid’s Parish Church, Kildare. While staying at the Hermitages guests will be able to access the Centre and avail of the peace and tranquillity of the Brigid Room and the Prayer Room and have the opportunity to choose a book from the library in the Anamchara Room. Each Hermitage is beautifully equipped with a kitchen/living room with a solid-wood stove, and a single bedroom and en-suite bathroom with shower. They are tastefully decorated providing warmth, comfort, privacy and peace in a quiet and secure countryside location on the outskirts of the historic Heritage Town of Kildare. This is an ideal setting in which to enjoy some personal space without the interruptions and distractions of the usual business of life and a hectic lifestyle. Guests may check in after 1.30 p.m. on the day of arrival and check out at 12.00 noon on the day of departure.